Prezi Presentation Template with a technology theme. Man and woman holding various modern technology devices. Devices included: laptop, iphone smartphone, ipad tablet, smartwatch, smart google glasses, earphones, digital photo camera. Talk about how technology has changed our everyday life and wearable devices. Present about information technology, security in digital ages or compare genders and how much they use technology. 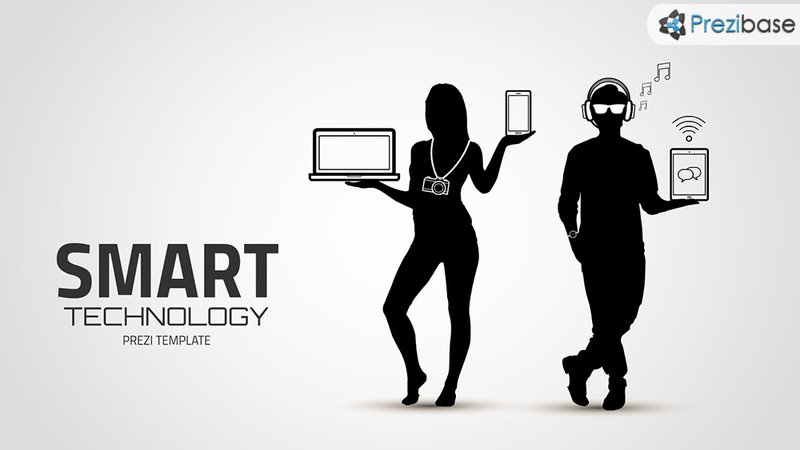 Template illustrates how technology has become a part of our everyday life. This entry was posted in Best Prezi presentation templates and tagged about, and, apple, become, camera, comapre, compare, devices presentation, digital, digital photo camera, earphones, ipad, ipad tablet, iphone, iphone smartphone, laptop, man woman, prezi template, prezi templates, recording glasses, silhouettes, smart devices, smart glasses, smart google glasses, smart headphones, smartwatch, technology, technology presentation, watch, wearable technology.